The £25k Awards – the search for the next big thing! The £25k entrepreneurship contest is a commercial educational experience designed to encourage researchers and individuals to act on their talents, ideas and energy to produce tomorrow’s leading commercial opportunities. The programme helps identify, qualify, prepare and present the best knowledge-based ideas and intellectual property from the publicly funded research base in Northern Ireland with the most commercial potential. Managed by the Northern Ireland Science Park’s CONNECT programme, the £25k competition provides a refinement process for entrants. Its network of mentors, investors and potential partners, and the cash prizes awarded have helped many of these teams of the past to act on their dreams and build their own companies and fortunes. Through the £25k competition, applicants will experience the unique opportunity to connect and engage with established science and technology corporations, entrepreneurs, service providers and investors who are interested in promising technology. This programme will connect the inventors with relevant stakeholders to increase the propensity of commercialisation and turning breakthrough ideas into reality. The competition is open to any member of research staff, academic, masters or PhD student, doctors, nurses or individual in any facility where public money is spent on R&D. Naturally, this includes HSC trusts. All applicants must be willing to devote the time and commitment necessary to all components of the £25k award, with a genuine ambition to commercialise their idea. All entrants (except undergraduate students) should contact the technology transfer office at their institution well in advance of the submission deadline, to ensure the intellectual property ownership is clearly defined and where appropriate the idea is protected. HSC researchers should therefore contact HSC Innovations well before the application deadline of 22nd April 2011. Further information about the competition is on the website at www.nispconnect.org/25k/. 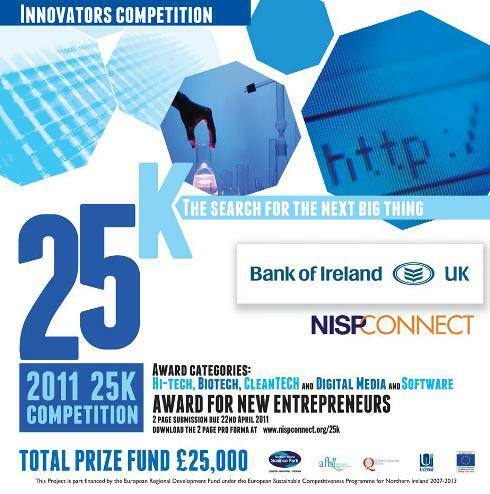 The 2011 £25k Award competition launch event will take place on Monday 28th March. For further information and to attend see the website at www.nispconnect.org/25k/.